The Westmead Anaesthetic Manual has been assisting anaesthetists and other acute-care doctors and nurses to save patient lives and improve patient safety care for the past 15 years. This fourth edition continues to present a step-by-step guide to anaesthetic practice. It has been fully revised and updated to reflect current best practice in the management of almost every type of anaesthetic emergency. * the most current recommendations for the management of anaphylaxis from the ANZCA Anaesthetic Allergy Group. 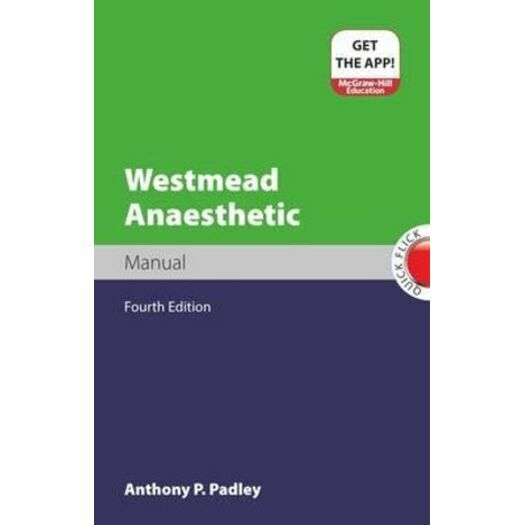 No other anaesthetic manual on the market is as compact, comprehensive and user friendly as the Westmead Anaesthetic Manual. It is the book you need when dealing with the complex, the unexpected and the dreaded in anaesthetic practice. Anthony P. Padley, MBBS (UNSW), FANZCA, is a Senior Staff Specialist Anaesthetist at Westmead Hospital and a VMO Anaesthetist at Westmead Private Hospital.